When I was a kid my biggest dream was to work for an amusement park (this dream has been accomplished). The second part of that dream was to work for Disney as an Imagineer. As a kid, my definition of an Imagineer was the following: “the awesome people that build the rides.” Obviously, with age, years of amusement park experience, and a much larger vocabulary, that definition doesn’t quite encompass all that Disney Imagineers do. Disney Imagineers are brilliant storytellers. From conception until grand opening, Imagineers are the driving force that creates an experience for guests that visit a Disney park. Every detail, from the font on the sign, to the shrubs out front, to the actual attraction itself is created by these talented individuals. This isn’t just a short process either; it can take years to design and develop these attractions. Imagineers are given the opportunities to dream, take a blank canvas, and create something that transports park guests to another world. I could go on for days talking about different Disney parks, Imagineering, hidden Mickey’s, but instead, first check out this trailer for a brand new documentary by Leslie Iwerks which will be released in 2016, all about Disney Imagineers. I watched this and immediately felt that excitement. I felt my creative juices flowing. I felt like that kid all over again, wondering what new world I would get to visit next time I visited Walt Disney World. 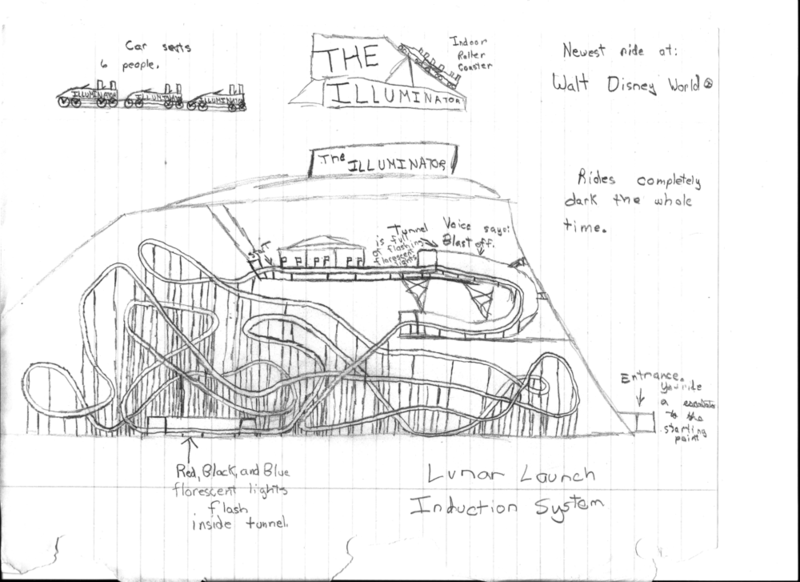 CLICK TO ENLARGE - The outside of Cole’s 6th Grade Imagineering folder used from 1997/98 to dream up new amusement park rides. Yes, it may just look like an old dated gray folder (from 1997/98 actually), but open it up, and there is a huge section of my childhood just sitting there. 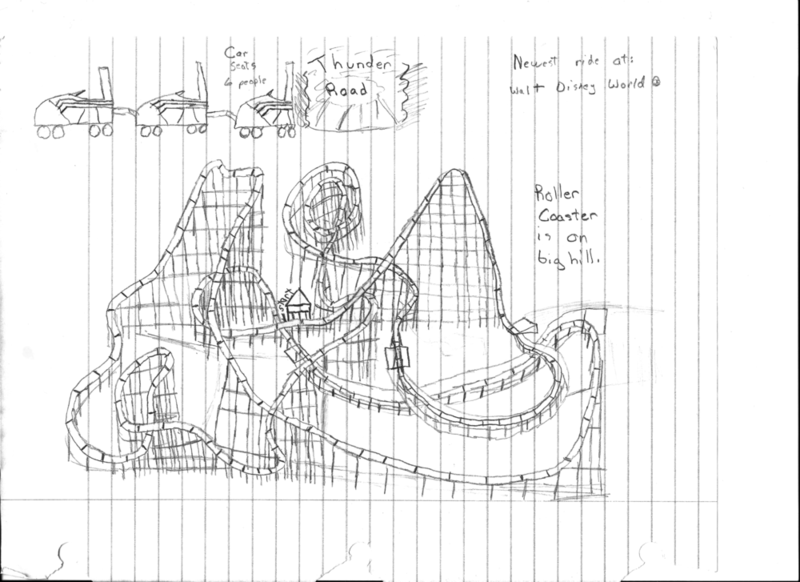 CLICK TO ENLARGE - The inner contents of Cole’s 6th Grade Imagineering folder used from 1997/98 to dream up new amusement park rides. In the 6th grade, after visiting Disney World just one time, I had begun to collect as much information about roller coasters as possible. I learned their names, designers, and locations. I thought Disney World didn’t have enough roller coasters. So, I spent my 6th grade study hall class designing roller coasters, creating stories for them, and labeling every picture in the top right corner with the words, “Newest Ride at Walt Disney World”. Don’t believe me, take a look. The Submarine – A roller coaster built next to a lake which included see through aquarium tunnels, and a shark attack. 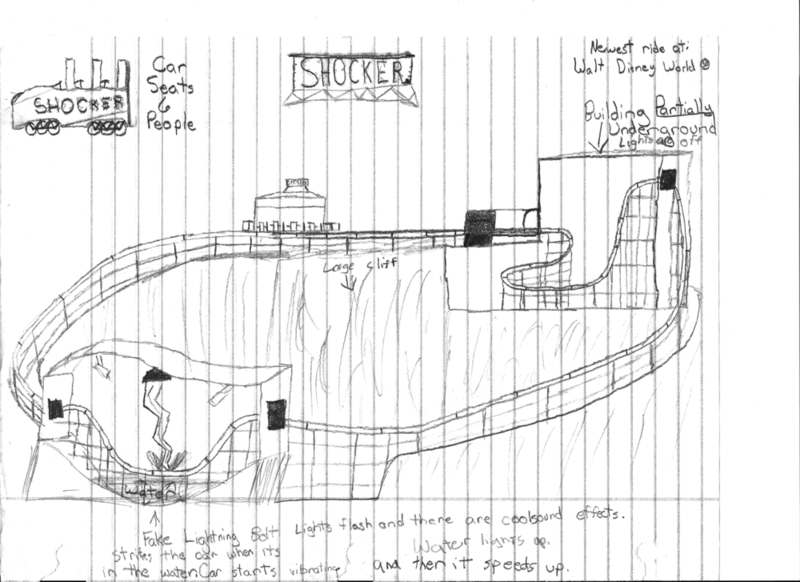 CLICK TO ENLARGE - The Submarine – An original design from Cole’s 6th Grade Imagineering Folder. Breakdown – A fully immersive experience which looks to have included both forward and reverse sections, a tunnel, a special effects showroom, an avalanche with styrofoam balls, and a collapsing bridge. 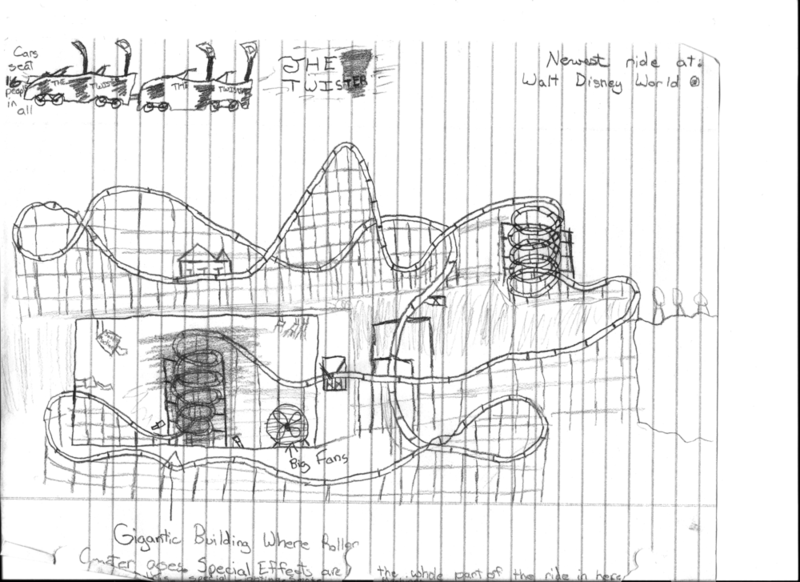 CLICK TO ENLARGE - Breakdown – An original design from Cole’s 6th Grade Imagineering Folder. Thunder Road – A wooden coaster designed to be placed on a hill, complete with two tunnels. (I cannot completely remember the story for this one, but I believe it had to do with motorcycles). 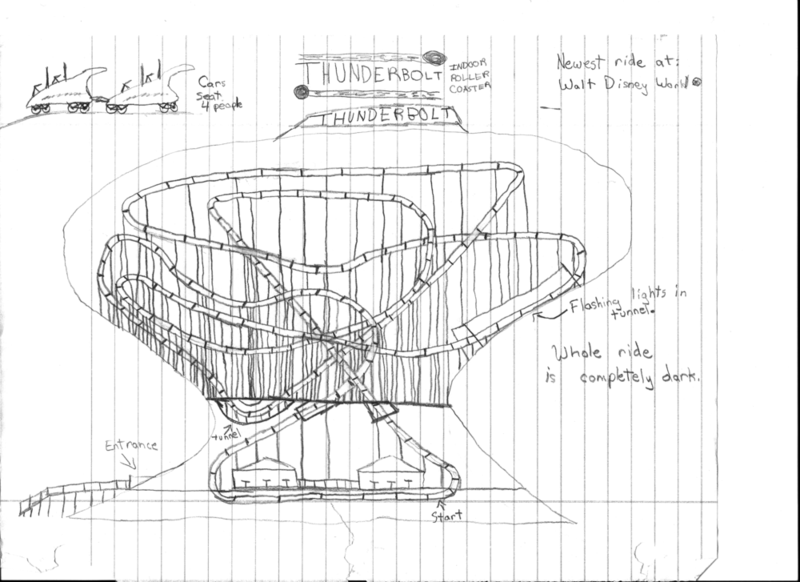 CLICK TO ENLARGE - Thunder Road – An original design from Cole’s 6th Grade Imagineering Folder. I had 14 drawings in all. What can I say? I had a big imagination, and I’m happy to report, that imagination never went away. My 6th Grade Imagineering Folder means a lot to me. While I never became a true Imagineer, when I was at Worlds of Fun, I had moments in time where I felt like an Imagineer (a much smaller, no budget Imagineer). When I got the opportunity to develop new game ideas with my staff, that was a result of my love for Imagineering. We would sit around, toss up ideas, try to be creative. I even had a Disney Imagineer book sitting on one of my office tables for years. I felt even more like an Imagineer when we actually built the games, like this giant slingshot! CLICK TO ENLARGE - Slingshot designed and fabricated by the 2011 Worlds of Fun Games Department for a brand new game called Pigs of Fury. For me, Imagineering is much more than a “job” with Disney. Imagineering is this idea that with a little bit of a spark, one tiny little idea, you can create something extraordinary. You can take that one little idea, and with lots of hard work, a huge amount of patience, and a whole lot of drive, bring that idea into existence. Imagineering is reaching above and beyond to create that moment in time where dreams and reality collide to create something special.